Someone pinch me, I think I’m having another dream. Just like the one I had when my kids were eating chocolate hummus. Oh yes, this dream became real life when I made chocolate hummus, but hold onto your hats folks because there’s another contender in town for the best hummus ever: chocolate chip cookie dough hummus. The crazy part of this dream, is that it’s not a dream at all. Those quotes up there are WORD FOR WORD what came out of my 8 year old’s mouth, I kid you not. My 7 year old had some good things to say too, but I couldn’t understand her very well as she was stuffing big spoonfuls of chocolate chip cookie dough hummus into her mouth at the time. But she said them with a smile and asked for more when she was done, so I’m thinking she’s a fan too. 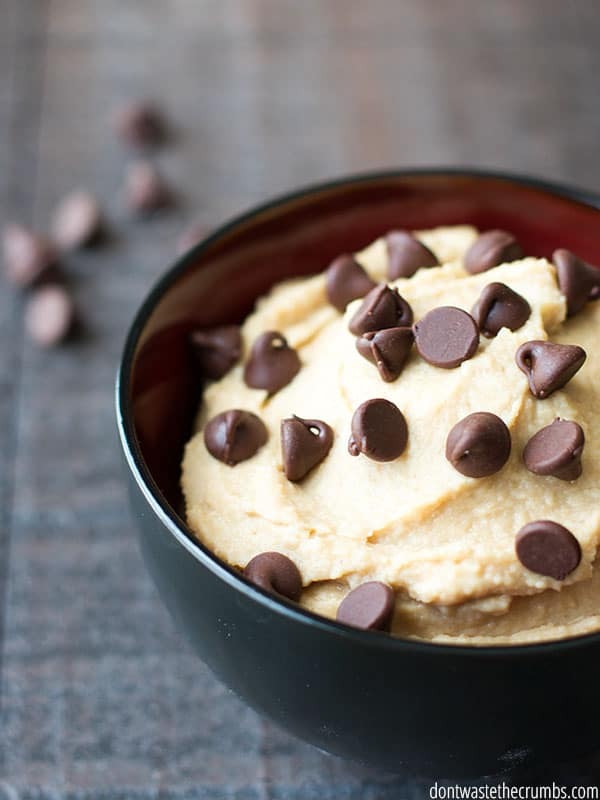 Chocolate Chip Cookie Dough Hummus: Just a Dessert? 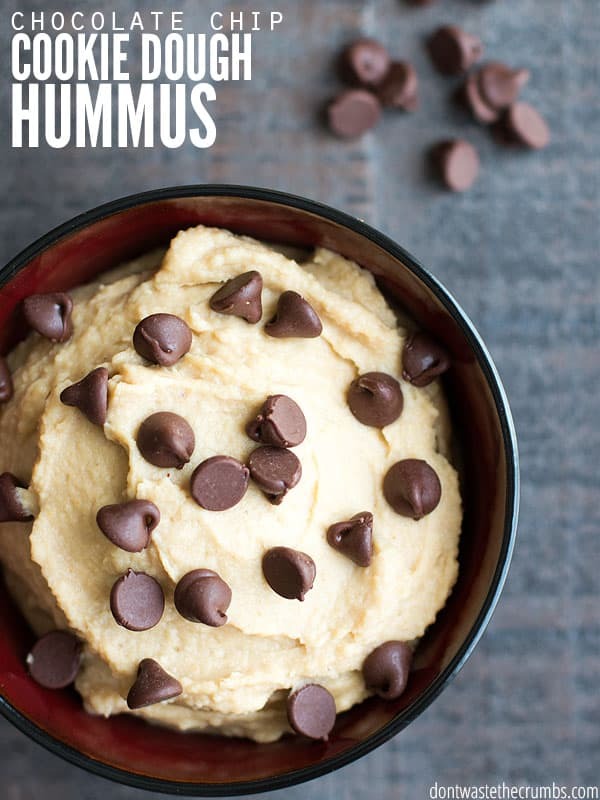 Technically speaking, chocolate chip cookie dough hummus is considered a dessert hummus. Also technically speaking, dessert is served after you’ve had dinner. But here’s the thing: I don’t really care. My kids are willfully eating beans and begging for more and that makes me a happy camper. They’ve eaten chocolate chip cookie dough hummus as a snack (as-is with a spoon and again with apples to dip), in their school lunch (again with a spoon but this time with celery to dip) AND as dessert (with extra chocolate chips – such a rebel!). This chocolate chip cookie dough hummus is almost as popular in my house as black bean brownies. IN FACT, just yesterday in the car on the way home from school, the kids asked me to make BOTH chocolate chip cookie dough hummus AND black bean brownies. True story! Those people who label foods into technical categories may call it dessert, but I call it a win (and a dream come true!). It’s actually what gave me the idea to make snickerdoodle hummus and cake batter hummus too! It’s all the same really. It’s healthy, it’s egg-less, it’s edible, it’s raw and it tastes like cookie dough. Oh yeah, and it’s made with beans! Wait. What just happened here? Did you just say TOO MUCH CHOCOLATE and NOT ENOUGH BEANS and you’re 7 YEARS OLD? All moms across the world need to sit for a moment and bask in the glory of what just happened and realize that THIS CAN BE YOUR LIFE. It’s perfect for a peanut-free school lunch. Serve it plain with a spoon, with fruit to dip, rolled up in a tortilla… however you want. But my kids took it for lunch and brought home a container that had been finger-licked clean, I can tell you that much. I prefer this hummus after it’s been chilled in the fridge a few hours. 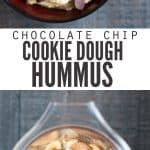 You certainly don’t have to do that – my kids eat it right out of the blender (this is the one I have and LURVE) – but cold chocolate chip cookie dough hummus reminds me of the times when I used to sneak into the fridge and cut myself a “slice” from that log of raw cookie dough. Did you ever do that? Try this hummus cold. Do you still do that? I won’t tell. I used my Blendtec, a high-powered blender that makes cooking and prepping a million times easier. I used to have a big food processor and if you have one of those, that will probably work too. I honestly got rid of mine because I just kept using my blender instead (you can find it here). The container for my small food processor/immersion blender combo broke during our move from California to Georgia, so I don’t know if that will work or not. However, I think the container itself might be too small. If you have a regular nothing fancy blender, that should work too. You just might have to blend it longer. You can use either canned beans or cook dry beans from scratch. If you use canned beans, I have two thoughts to share. First, in my recipe testing I noticed that organic beans have less (if any) additives and preservatives compared to conventional beans. Second, I also noticed that they didn’t cause as many issues with digestion and flatulence as conventional beans. Now, I don’t know if there is a direct correlation there, but if you’re going to use canned beans, I recommend organic for the flatulence issue alone. This recipe is too good to not make because of excess toots! Canned beans tend to be just a bit higher in price than dry. However, you can find good prices on canned and stock up for those times you need to make dessert hummus STAT. ALDI carries organic garbanzo beans for a good price, but they’re also available on Amazon. Whether you buy organic or conventional, rinse the beans them at least 3 times before making this recipe. To rinse, drain the beans into a colander. Pour them into a bowl and cover the beans with water. Swish the beans around the water for about 10-15 seconds and drain into the colander. Repeat the process a total of 3 times. If you’re cooking beans from scratch, I highly recommend cooking beans in a slow cooker (or the Instant Pot). Not only is it CRAZY easy, but you can make a ton of beans at one time and freeze them in 1 1/2 cup portions. That way you’ll have beans ready to go when the kids (or you) want more chocolate chip cookie dough hummus. Which will happen (heads up). Just about any type of chocolate is a great topping. Dark chocolate, semi-sweet chocolate, milk chocolate… chips, chunks, mini-chips, cut up bars, leftover Halloween / Easter / Valentine’s Day / Birthday Party candy… Whatever you have will work. Folding in the chocolate at the end is the classic method, but you can also portion out plain cookie dough hummus and top with chocolate too. I actually prefer this method of serving because it allows me to control the amount of chocolate I want the kids to have. Do you think we could use it in ice cream? Maybe scoop out small balls onto a cookie sheet, freeze them and then cut them if necessary before folding into homemade vanilla bean ice cream batter at the last minute? Not a bad idea. Let me know if you give it a try, okay? Combine all the ingredients except the chocolate chips in a blender or food processor. See notes for the maple syrup and salt. Blend or puree the ingredients until everything is smooth and combined well, about 2 minutes. Fold in the chocolate chips and serve; alternatively, store the hummus plain and add chocolate chips just before serving. * Maple Syrup: Adjust the amount of maple syrup to your liking. You might be able to get away with less, but we've found that this amount is just enough to counteract the "bean" taste that kids seem to struggle with. You also might find yourself needing less the more times you make it, as your taste buds will adjust. 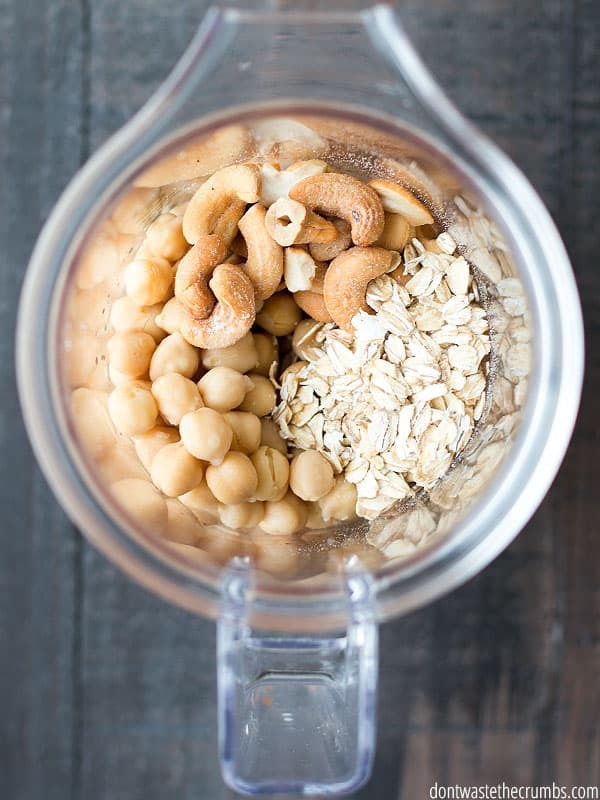 * Salt: If you're using canned beans and/or salted cashews, start with ⅛ tsp of salt. Taste the hummus when it's done and add more as desired. 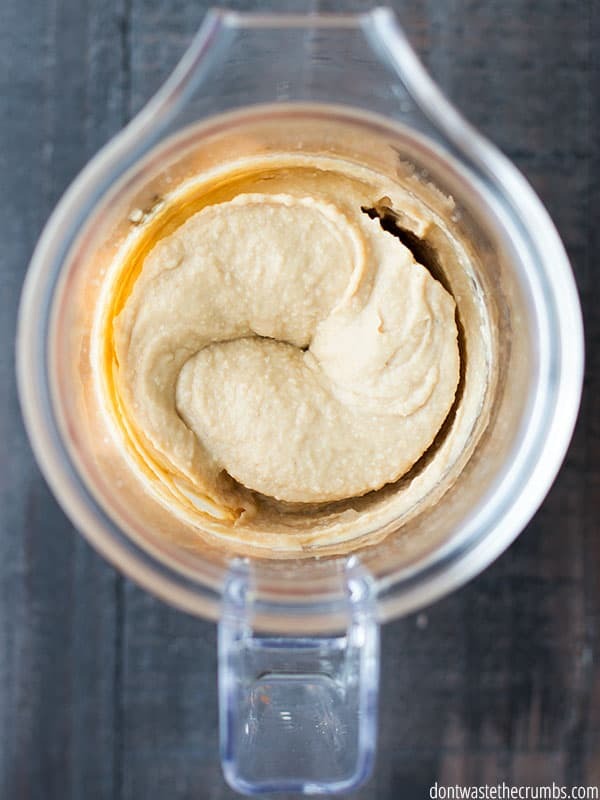 Ready to make some Chocolate Chip Cookie Dough Hummus? I like to make my beans in the Instant Pot in a big batch and freeze the extra for later. But canned beans work well too. Use your price book to stock up so you have plenty on hand! This is the blender I use to make this recipe super quick and easy. This food processor would work great too. I can often find chocolate chip rebates in my Ibotta app. I’m always happy to earn money on the food I plan to buy! I’m on a roll with hummus lately – got any other flavor ideas that sound good to you? Share them in the comments! Would this work with another type of nut? My son is allergic to cashews. Thanks! Yes! You can use any nut you want. I chose cashews because the flavor is negligible in the finished hummus. If you choose another nut, know that you have have a slight taste of that nut in the end. Any recommendations as a replacement for the nuts all together? Kiddo is allergic to all nuts. Hi Jen! I haven’t tried this myself, but I think sunflower seeds might be a good substitute. Let me know how it turns out Susan! I tried replacing nuts with 1/2 cup oat flour. I just dumped some organic rolled oats in the food processor first to process finer. No need to process until really fine like flour. A little chunky gives good texture. I put the excess oats in a glass jar in my frig for another time. I also added 1/4 cup of the oat flour at the end to give extra texture and more oat taste. I also scooped mine into balls and baked them at 350 degrees for about 20 minutes. Yum. You are awesome! I’m soaking the beans now. Thanks. Nut-free school. I’ll try sprouted sunflower seeds. Let us know how it goes Sangeetha! This looks awesome! And I agree, if my kids are eating beans like this, they can have it whenever. And me too. Can you tell me if you are using regular old Maple Syrup from the store (like Mrs. Butterworth or Log Cabin) or the real stuff? We sadly don’t eat the real stuff. Could you try brown sugar? You definitely can Rachel, if that’s what you have. Start with half the quantity than the recipe calls for, and and add more to taste, blending in between each addition. I made it with low cal low fat grocery store syrup and it worked super Well! Whatever kind you have Audra! I can’t wait to try this! I have a 3 year-old who inherited his father’s sweet tooth and I struggle to come up with healthier alternatives to traditional cookies and candy. I’ve made a lot of different things but can’t always get him to eat it. I’ll definitely be trying these. I hope he likes it Adriane! I love the sounds of this. . .and will definitely be giving it a try! A healthier treat for my sweet tooth! This sounds great! Can you just clarify the amount of Garbanzo Beans in cup measurement? I have canned beans in differing can sizes. Absolutely Sarah! 1 1/2 cup cooked beans = 15 oz canned beans. I hope this helps! Oooo – can’t wait to try, except one thing, I don’t really like the taste of maple. Have you ever tried with (raw) honey? Thanks!!! Hi Laura! I haven’t, but I bet it will be just as good! I just made these tonight and I really couldn’t taste the maple, although I did only use 1/4 cup and had to substitute the additional 2 tablespoons with Rapadura. They came out great! I made this with high hopes this afternoon (using raw honey instead of pure maple syrup) and we tried it later in the evening. Two of the kiddos liked it, but the rest of us did not :(. I could totally taste the beans. Oh well, at least those two kiddos are happy they get “cookie dough” as an after school snack! 🙂 Thank you for sharing your discoveries! Aw, I’m sorry Laura! Do you think it was the honey in lieu of syrup? I swear we can’t taste the beans, but I personally haven’t made it with honey yet either. Sadly, it’s not the honey. I made it just like you said. Even bought the pure maple syrup. Thankfully my 3 kids and husband liked it just fine. Though for the first time ever, I did not tell my kids what was in something. I just told them it was like cookie dough, but they could eat it. If I told them it was beans, they would likely not eat it. My husband knows though. I however, can still taste or maybe it is more the texture than the taste, not sure, the beans. Maybe a little of both. It is grainy and I ground it for a while in my food processor. But I am still thankful to have a healthier snack to give my kids. Just wish I liked it too. I found the same exact thing as Jen (it’s good to know it wasn’t the honey, because I won’t use pure maple syrup because of taste). 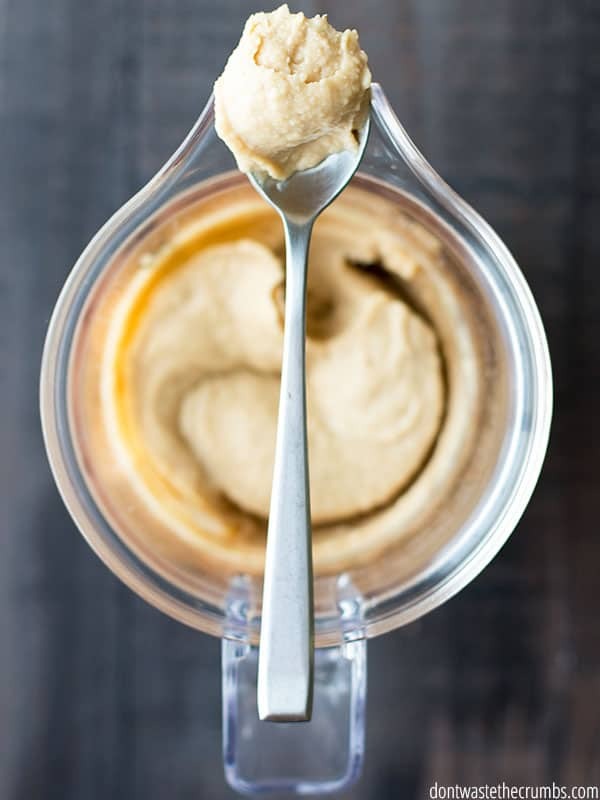 I know the texture of pureed garbanzo, so between the flavor AND texture, there was no denying it to me (I don’t mind hummus, but I personally don’t think that texture can pass for cookie dough, even sweetened). I too, left out the “hummus” or “bean” detail for the kids, but hubby knew something was up….hahaha! 🙂 Maybe it needed more honey, but for sure the texture, even pureed at 2 minutes, won’t change. Maybe try using white beans instead of garbanzos. Garbanzo beans seem to have more of a grainy texture but white beans are more smooth. This is awesome! I love it, and so does my two-year-old. We’ll see what my husband thinks when he gets home today. I am pregnant, in my third trimester, and supposed to have 4 servings of protein a day. I can see this helping! As for the “grainy” texture others commented on, I have found that with garbanzo beans before. I usually make regular hummus with plain white (northern) beans, and it gets very smooth. So that is what I used for this. I also used brown sugar because I didn’t have maple syrup. So, I was one of the “grainy” commenters. Kids liked it, but I couldn’t handle either the texture or the flavor. I thought I would try it with the White (northern) beans that you mentioned and I was wondering if you cooked them, bought them in a can, etc? Did you rinse like Tiffany says to do with the garbanzo beans? I don’t have much experience with beans, so can use all the help I can get. I am not pregnant, but could use more protein in my diet. I used dry beans that I cooked myself. I soak them overnight, then dump the soaking water and rinse them, and then add new water and cook them. The little white beans only take about half an hour. Then I drain and rinse them again and use them or freeze them in 1.5-2 cup portions. Good luck! It was a hit here! Made one batch with maple syrup (and certified gf oats!) and it was really good. Second batch was made with brown sugar because we used the last of the maple syrup. It was a little more dry but still very good. Used a df chocolate bar broken up on top for the chocolate bits. We tried it with apples, but find the preferred method of eating is right off the spoon! Ok gonna try this as an afternoon snack with apple slices today with my boys. Hoping they love it. Did your boys like it? I just made it and my two-19 month old little buddies I watch liked it without chocolate chips. Kept handing me back there spoons to put more on. I think it will be awesome cold and with the chocolate chips. Hoping my 3 boys like it when they get home from school. I think spreading that on crepes with sliced fruit would be awesome. That’s awesome news Kathy! So glad they liked it! This is now my 20 month old’s favorite food! The h-word (hummus!) slipped out as I was preparing it, so my 4 year old was very skeptical. He tried a little and said, “well at least I like this kind of hummus!” Thanks for the great recipe. I was skeptical of this because I don’t really like garbanzo beans and my husband and daughter don’t really like beans much at all. I figured I would give it a shot and if no one liked it all I had to purchase was the can of beans. My husband and 5 and 1 year old daughters liked this, Me too! Thanks for the great recipe! I recommend anyone to give this a try. Has anyone tried this with garbanzo/fava flour? To offset the grainy texture I just switched this to an oatmeal cookie and added organic oats. The oats also offset the bean taste some. I forgot to say in my earlier post that I added 1/2 tsp baking soda and 1 tsp raw apple cider vinegar to bake them into cookies. Just tried this & it’s amazing. I used the leftover mixed nuts I had from Christmas & frozen chicken peas that my grocery store just started carrying. Wow! Even hubby liked it. Thanks for the glowing review Laurie! Great idea to use up the leftover nuts too!! I’m looking for a Birthday Cake flavored hummus! Any suggestions?? Love the cookie dough, and DID put it in homemade vanilla bean ice cream … fantastic. Ooh – interesting flavor! I haven’t seen it before, but I’ve added it to my list of things to try! We made this tonight and sadly, the garbanzo bean flavor was just too strong (and I love hummus!). I gave my 8yo a bowl with graham crackers and apples both to dip it in (not telling her what it was), and she wasn’t fooled. I want so bad to love this, but the bean flavor and texture is just too much! Wahh! Has anyone who tried other beans had more success with less bean-y flavor and smoother texture? I made it with Great Northern beans (which I actually use for regular hummus, too), and it was great! Smooth and not bean-y at all. You could try them, although now that your daughter has tried it and not liked it, she may be suspicious! This is so yummy! I just made it. I made a couple small changes: used walnuts instead of cashews, added a little honey in place of some of the syrup and added some powdered peanut butter. Even my kids like it! Those sound like delicious subs Crystal! Ok, so call me skeptical but this really did not sound good to me at all. I only made it because I need something to send in my kids school lunch tomorrow. I made it with cannelloni beans because it’s what I had in the pantry. My kids are not terribly picky, only just a little. They will eat veggies but won’t touch beans with a 10 foot pole. They are currently eating this stuff with carrot sticks and bunny grahams. I can eat it because I like beans but I can still taste them in this, so I made one change: add 1/2 t cinnamon to help hide the taste of the beans. My recipe will call this cookie dough. It’s a keeper. Thank you! Hi Stephanie! Thanks for sharing your substitutions with us, and I’m glad the cinnamon helped with the bean taste. Glad it’s a keeper for you!! I just made this today and my 4 year old and I have been eating it by the spoonful, in between dips of apple slices and chocolate graham crackers. I also subbed a little of the maple syrup with agave nectar and it was great. Thanks! So glad you liked this Carrie! I was so excited to try this recipe. Followed it exactly and nobody in the family liked it. We could all taste beans. Just tasted like sweetened beans. Had to throw the rest away. We love your rosemary sea salt flatbread recipe though. That bread is the best! Oh bummer! Most people can’t even taste the difference. Can I ask if you used canned beans vs. cooked dry beans? I used canned beans. Maybe I will try it with the cooked dry. Do you think that will make a difference? I think so. I’ve noticed that when I used canned beans, I can still taste the bean-y-ness (new word! ), if that make sense. When I make them myself, I taste a legume, but the “bean” taste is much less pronounced. Anytime I use canned beans, I rinse like CRAZY – at least 3 times soaking and rinsing, sometime more, because I think that solution that they sit in enhances the bean flavor. If you have some dried beans on hand, it’s worth a shot! Thank you! I will have to try it! This is a fun recipe, thanks. The article however is distractingly hyperbolic in tone. Kids liking sugar and fat is not surprising, and this recipe is has plenty of both. It is much better then traditional cookie dough though, so thanks for sharing. Hi Jen! Not to get nit picky, but the fats in cashews are super healthy, and the low amount of pure maple syrup is a WAY better choice than any commercially processed snack on store shelves. And it’s not that they like fat and sugar – it’s that they like BEANS. In my house, there’s nothing wrong with healthy fat and we eat natural sugars in moderation. I finally got around to make no this and I must say at first I was a bit turned off by the chickpea taste that still came through even with the vanilla, chocolate chips and maple syrup. But once I add 2 tablespoons of PB2 which is gluten free what a difference! Love this s snack! I’m glad you found a workaround for the chickpeas Teresa! It’s hard to gauge, since all of our taste buds are different. But hey, you do whatever works for you! I wonder what this stuff would taste like with white beans. For me, I’m not that much of a nut lover, but I do love creamy peanut butter. I wonder if there are any seeds I could put in there. If I was to make this hummus, would it work to cook the beans in a crockpot? Since I can’t really use the stove without sighted help. I bet my sweet love, John, would absolutely love this recipe. And any children we have might get a kick out of it as well. Though my mom certainly thought it a strange combination. I mean, chocolate and garbanzo beans? For me that might taste a bit strange. That’s why I was asking about other bean possibilities. Do the beans substitute for raw egg? I’m confused on that one! Sunbutter? Interesting! How would I make that? Would I have to have something like a coffee grinder? Is it the beans that make it taste like the texture of cookie dough? I’m confused on that one! Kind of – pureed beans alone are very smooth, but when you add in the oats, it makes it a bit thicker. Hi! Can you give me the nutrition facts? Fat, calories, dietary fiber, and protein? Thanks! By the way, this was delicious! I’m so glad you liked it Kristen! I don’t have the nutrition information handy, but you’re welcome to use an online calorie calculator! You have no idea how much this recipe has helped me! I have binge eating disorder, and for the last few months I have been in relapse; spending so much money on food and eating mass amounts of sugar and salt until my stomach hurts. I went vegan several months back, thinking it would solve my problem, but then worked at a vegan grocery store for a while and I took it all out on my stomach. I’ve made this dessert hummus about three different times now, and every single time it has hit the spot and filled me so much that I don’t feel the urge to keep eating. It’s soooo good after sitting in the refrigerator and I keep having to remind myself that it’s healthy, because when I eat it I feel like I’m having another bingeing episode, but of course I’m not. I’ll be having this for breakfast very often. I’m so glad you enjoyed this recipe Emii!! First of all, thank you for being funny. 2 questions, and there were so many responses that I did not read…apologies if these questions were already asked. 1) How come I have to rinse beans so thoroughly? 2) Have you ever tried baking cookies with a garbanzo bean ? Thank you! Just made this. Substituted toasted almonds for the cashews, and 2 tbsp brown sugar + 1/4 cup maple syrup for the amount in the recipe. Then I added a small nob (may be 2 tbsp) of cream cheese to help smooth out the consistency. Turned out great. Great ideas and additions Chris! I just eat it straight from the bowl! Is that wrong? I made this today and it’s awesome! I subbed a little honey as I didn’t have enough syrup. Turned out awesome. So glad you enjoyed this Lori! When I make hummus I cook rinsed, dried beans in my pressure cooker for about 45 minutes. I use 1 cup of beans to 3-4 cups of water. I can hardly wait to try some of your recipes. I’m all for quick, easy, inexpensive, REAL food. Ooh – good choices for swapping Mara!! Could I replace some of the maple syrup with applesauce to lower the amount of added sugar? You probably can Julia, but I would do it one tablespoon at a time so you don’t effect the texture of the outcome. And keep in mind you’ll have a slightly different flavored hummus as well.